Blue no scratch mitts feature embroidered gray Mickey logos. White booties feature Mickey Mouse imagery in front and Disney logo in the back with a gray trim. 3-Piece gift set includes hat with no scratch mitts and booties featuring Disney's Mickey Mouse. Style: Short Sleeve Mickey Mouse Short Set. Size: 0/3 Months. Care: Machine Washable. I don't have a set. Color: Blue, Red, White, Gray, Black & Beige. If any problems. 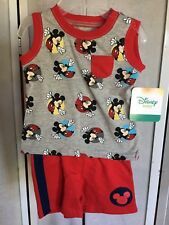 Style: Sleeveless Mickey Mouse Short Set. 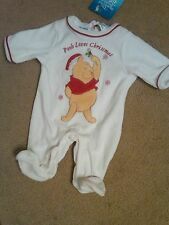 Size: 0/3 Months. Care: Machine Washable. I don't have a set. Color: Red, Blue, Gray, Yellow, Beige, Black & White. If any problems. 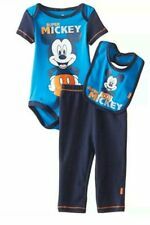 This is a boy's 2 piece Mickey Mouse set size 0-3 Months.